Newspaper scoops are no longer possible. Today's instant worldwide communication means that any important news breaking story is immediately copied, rephrased or translated, to be posted on thousands of news Web sites in dozens of languages within minutes. But 66 years ago, in World War II, in the tropical jungle of Papua-New Guinea, where Allied troops were fighting Japanese invaders, a unique newspaper called Guinea Gold published a record number of world scoops. That was because US General Douglas MacArthur, Supreme Commander of Allied Forces in the South-West Pacific, had given Guinea Gold permission to publish his communiques 20 hours before the news was released for the rest of the world's media. New Guinea was the only war zone where the US armed forces did not produce a local edition of their own newspaper, Stars and Stripes. Guinea Gold, with separate American and Australian editions, fully met their needs. Earlier in 1942, Melbourne Herald war correspondent Reg Leonard had suggested that the Australian Army should produce its own daily newspaper. Promptly crowned a major, he became Guinea Gold's foundation editor. Years after the war had ended, Mr R.B. Leonard, O.B.E., managing director of Queensland Newspapers Pty. Ltd., said that Guinea Gold's success was due very largely to dedicated people below officer rank - men who toiled uncomplainingly and for long hours in the ramshackle buildings that housed its overworked plant. He spoke of soldiers intercepting radio news by matchlight during bomber raids, some who set type by hand when mechanical equipment broke down, and others "whose brawny arms provided power for the presses when the electrical power failed." That was the memorable occasion when Japanese bombers attacked Port Moresby powerhouse at 2 a.m.
Horace ("Chis") Chisholm, the paper's last editor, also recalled the event: "Officers and men and natives toiled and sweated together as they turned the heavy press over by hand, but every unit received its share of the 5,000 copies they produced. "Overcoming incredible production problems, the newspaper came out seven days a week without missing a single day, from November 1942 to June 1946. Its 1,320 days' continuous publication was easily a world record for service publications. At its peak in 1944, it produced 64,000 copies (US edition 37,000, Australian 27,000). Maximum readership was estimated at 800,000. "The front and back pages concentrated on up-to-the-minute news from around the world, including coverage of major sporting events on the back page. 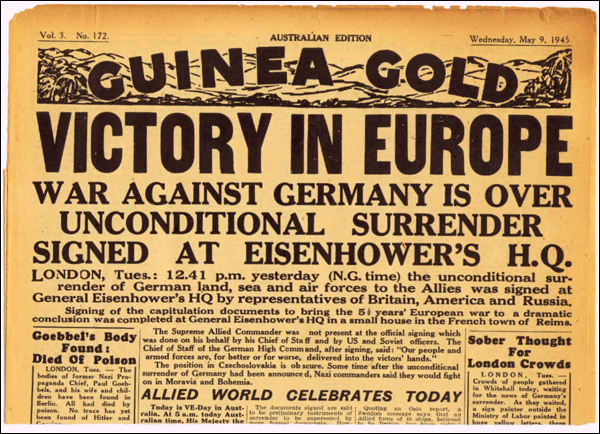 Page 2 was devoted to extracts from Australian and US newspapers published a few days previously, which air transport crews delivered to Guinea Gold. "Soldiers with newspaper experience, who had been transferred from other units when Guinea Gold was established, wrote news stories by taking shorthand notes of shortwave radio bulletins from Australia, the US Armed Forces station in San Francisco, the British Broadcasting Corporation (BBC), All-India Radio, and others. "At Lae, the second-hand Miller high-speed flatbed press ran 20 hours a day, printing 34 million copies in little more than two years. When it was retired after the war, it had 50 welds. It's now an exhibit at the National War Museum in Canberra." The worst crisis in Guinea Gold's life was the day that the Port Moresby linotype and the Dobodura press broke down simultaneously. The problem was overcome by having the type set in Dobodura, flying the type 100 miles over the Owen Stanleys [mountains], and the paper printed on the Moresby press. Papers for the northern edition were then flown back over the Owen Stanleys. It was a good example of the co-operation received from the air forces. RAAF pilots flew almost daily over the Japanese lines to drop small bundles to forward fighting areas, and the day after the American forces landed at Cape Gloucester, New Britain, Flying Fortresses dropped Guinea Golds to them. Always we thought of the men we served: men fighting in the lonely, dank, rugged, slimy jungle depths, hauling guns up steep mountainsides, repairing shell-torn signal wires under fire. On a lighter note, "Chis" recalled that when the newspaper promoted a "Girl I Left Behind" contest, 1,700 photos of wives, sweethearts and baby daughters swamped the editorial office. It was a beauty contest, with full-page portraits of gorgeous girls on the front pages of a Sunday supplement, and smaller photos daily. It proved so popular that it ran for more than four months. An Australian/US judging panel decided the winners were (Australian) Miss Dorothy Faull, Federal Capital Territory, friend of Leading Air Craftman M.J. Jones, RAAF and (US) Mrs G. B. Osmun, wife of Captain G. B. Osmun, US Army. Among his other memories, "Chis" wrote: "On one occasion a consignment of crossword blocks and clues failed to arrive from the mainland. 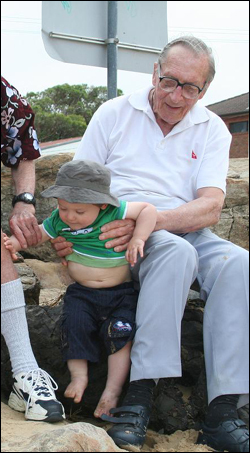 Staff-Sergeant E. Shackle (the Telegraph, Sydney) solved the current one and compiled one on a pattern previously used." A few years after the war ended, one of Guinea Gold's printers, Paul Jefferson Wallace, of Sydney, compiled and published a 32-page history of the newspaper, which is now one of my most prized souvenirs. It also provided useful material for this article. Wallace reported that on moonlight nights in its early days, production of the newspaper was often interrupted by air raids, but deadlines were still met. Blow-lamps were used to melt linotype metal during frequent power supply breakdowns. Because the hand-set type was so badly worn, it had to be packed with layers of gummed paper underneath, to raise it to type height. On one occasion, the printers ran out of T's. A native Papuan chiselled some out of wood. When there was a shortage of R's, editor Reg Leonard added tails to P's by cutting them from L's. Wallace also explained why an Army newspaper was needed in New Guinea. "In 1942, isolation was a morale-destroying disease in New Guinea" he wrote. "Radio sets were few and far between, men were cut off from day-to-day news. "The result was a flood of false rumours which swept along the Owen Stanley trail when Australian troops were just starting to push the Japanese back from their mountain strongholds. "From the first edition on Nov. 19, 1942, until the presses rolled to a stop on June 30, 1946, with the enviable record of 1,320 days of continuous publication, Guinea Gold daily brought to the news-hungry men of the Australian and American forces serving in the steaming jungle, topics of interest to allay their boredom and boost their morale." In all, 237 Australian soldiers worked on Guinea Gold for varying periods. Not one of them was there for the full three and a half years' life of that unique and vital newspaper. FOOTNOTE. Greg Ray described OhmyNews reporter Eric Shackle's army career, in a 2004 feature story in the Central Coast Weekend Herald.